Do you do Santa Claus? This is a common question I hear parents asking one another at Christmas time. The question comes from different perspectives and experiences that people have had with the story, tradition, and character of that jolly man, Santa. We’ve all heard stories of the proverbial thirteen year-old kid (or older) who finds out from their friends that Santa is not real and then cries for days both because there really is no Santa Claus and because they felt lied to all those years. We also know the stories of the “magic” of Christmas that children feel and the joy of watching them believe in a generous and mysterious character that comes down their chimney and leaves gifts and takes cookies. Here are three primary responses to the question that I’ve seen/heard. There, of course, is a spectrum in between these three major categories. Perhaps you fall into one of them. I would love to hear where you might be on this scale and why…..
KINDA: We’re not big about Santa Claus, but he’s unavoidable, so we’re not against him either. These are the parents who try to take the middle ground of wanting their kids to enjoy the Santa narrative of Christmas while at the same time not wanting to “lie” to their children. The presents under the tree may or may not be from Santa Claus, and the parents do not go to great lengths to keep the fictionality of Santa from their children. Some parents might try to “redeem” the story of the historical figure Saint Nicholas and tie that into the Biblical meaning of Christmas. NO: We don’t ‘do’ Santa Claus. This imaginary character distorts the message of Christmas. These are the parents who have either a theological conviction against the glorification of this ever-evolving fictional character or a moral conviction against what they consider to be lying to their children (or both). ALL the presents under the tree are from actual people (like from Mommy to daughter or Uncle Joe to Sally). The extreme side of this view avoids all depictions of and interactions with Santa Claus in an effort to focus on the Biblical story of Christmas and the person of Jesus Christ. The interesting thing about these three views (and all the others in between) is that we all share the public sphere together, and the question comes up as to how to approach the topic of Santa in public regardless of one’s personal position. If you are a part of position three, should you proactively “ruin” the story for others when given the chance? If you adhere to position one, should you (like Will Farrell’s Elf character) be actively proselytizing others to believe in Santa Claus? So how do you respond when someone says, “Do you ‘do’ Santa Claus?” What do you explain to your children and at what ages? What are your reasons for doing so? If you’re curious as to where Sarah and I fall on this spectrum, you can find some clues to our answer in a previous post I made about Santa Claus here. But I am more interested in all the other different perspectives out there. So feel free to share. Posted on December 16, 2016 December 16, 2016 Categories Christianity, Christmas, FamilyTags Christmas, Santa ClausLeave a comment on Do you do Santa Claus? There are two primary nativity narratives in the Gospels – the Matthew version and the Luke version. Have you ever noticed that Matthew talks about the Magi (but not the shepherds) and Luke talks about the shepherds (but not the Magi)? Matthew was writing to a mostly Jewish audience while Luke was writing with Gentiles primarily in mind. Perhaps Matthew thought the detail about the Magi would strike the Jewish hearers in a certain way while Luke found it important to write about the shepherds instead. I love the socioeconomic diversity in that contrast. The Magi were probably wealthy, royal, intellectual, and/or all the above. They traveled “from the East” just to see a little baby. On the other hand, a group of simple, common shepherds found their way to same little baby after hearing about the baby from angels. Royalty and commoners are both transformed by the power of this gift from God. Why? Because deep down inside we are all the same. Rich and poor – we all share the same human condition: depravity. And this baby would someday ride into Jerusalem on a donkey – a beautiful irony that mixes both triumphant victory and humble lowliness at the same time. He is the humble King – come to save princes and paupers. 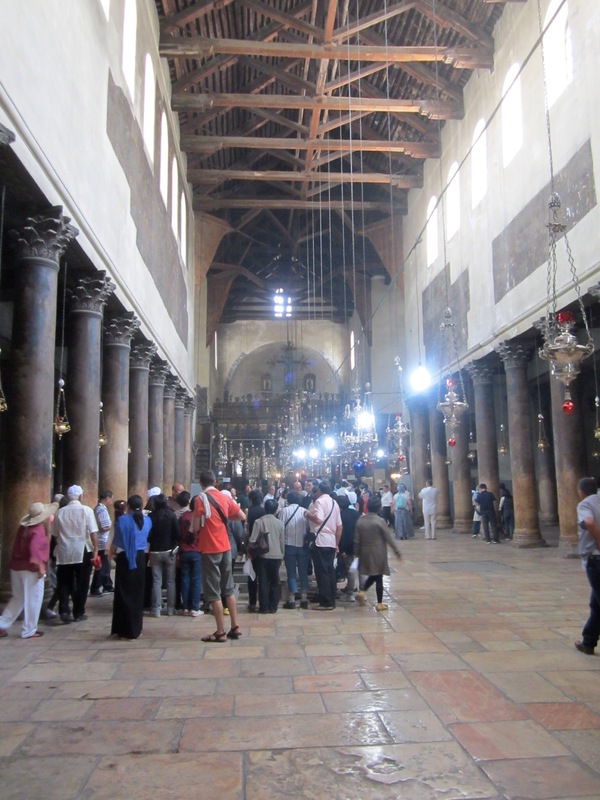 Pictures below are of the Church of the Nativity in Bethlehem. 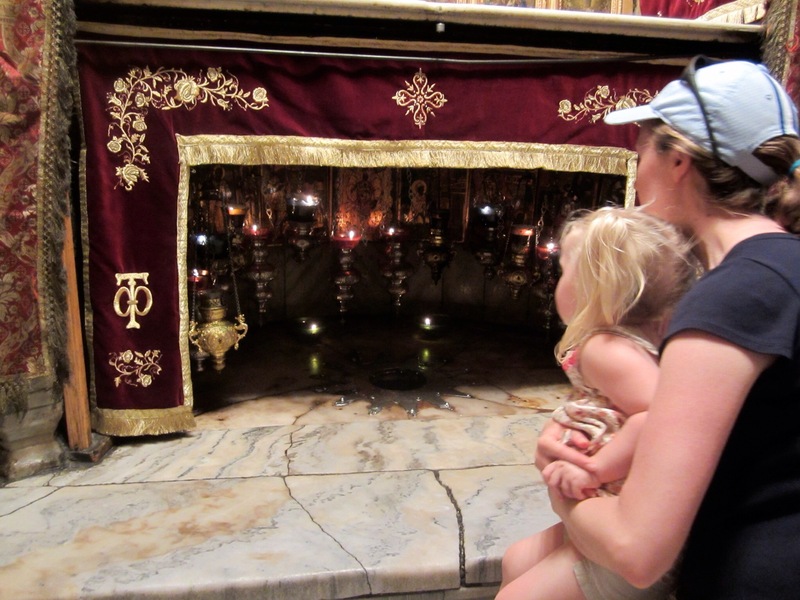 One is of the sanctuary area and the other is the small crypt where it is traditionally believed that Jesus was born. They probably don’t know the exact spot, but it gives you and idea of the small stone spaces in which people lived back then and at least you know you’re in the general vicinity of where it happened! Yesterday, I taught on the wise men from the Christmas story in Matthew 2. I always love teaching on this part of the Christmas story because there is so much more in the text than we usually learn from a simple nativity scene. 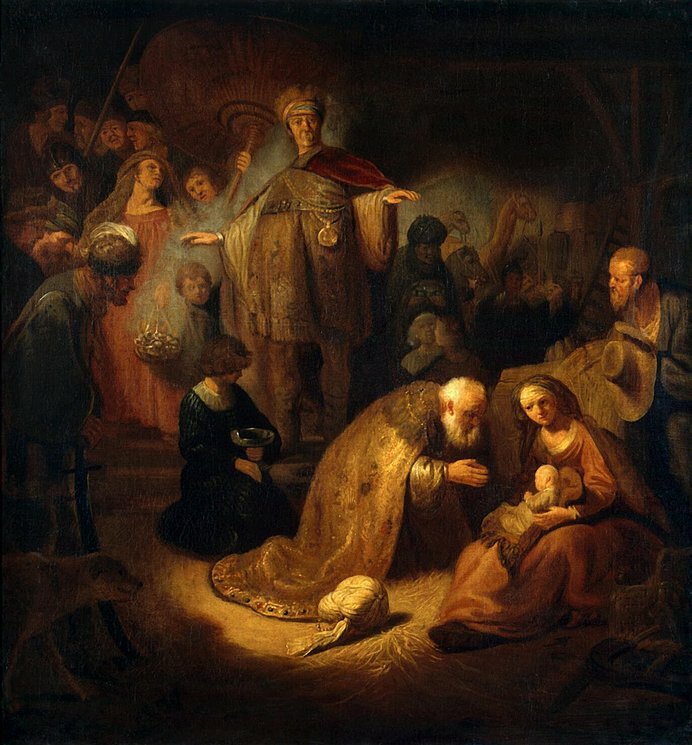 Here are three things that might help as you assemble your lesson if you’re teaching this story…..
First of all, the wise men probably arrived in Bethlehem sometime between when Jesus was two months old and two years old. The text says that they came from the East (probably anywhere from Iraq to India) after the baby was born, first to Jerusalem, then to Bethlehem (Matthew 2:1). The travel time alone is at least two months. So the idea that they came at the same time as the angels and the shepherds (like most nativity scenes show) is a faulty amalgamation of the Matthew narrative and the Luke narrative with no regard to the historical timeline. Jesus was probably two years or younger at this time because Herod wanted to kill all baby boys two and under when he found out he had been outwitted by the wise men, who never reported back to Herod about the whereabouts of the child (Matthew 2:16). Secondly, we don’t know how many wise men there were. The text simply says that there were wise men from the East (Matthew 2:1). So there could have been two or five hundred (or thousands). 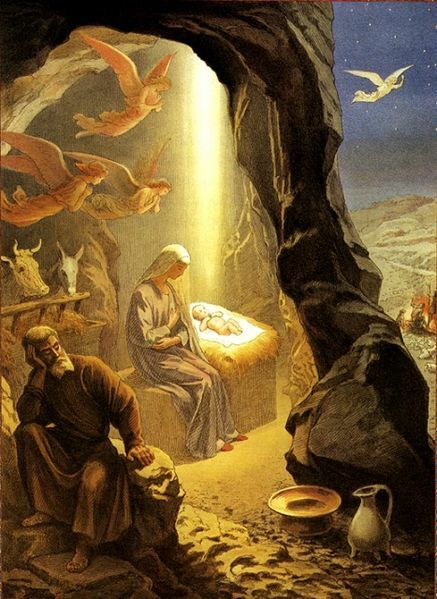 We get the number three from the number of gifts they brought – gold, frankincense, and myrrh. Thirdly, I love showing the kids some modern day examples of gold, frankincense, and myrrh. These were practical baby shower gifts. The gold was simply money that they could use for travel, lodging, baby needs, etc. The frankincense was a type of incense one could burn as an act of worship/offering at the temple – something Mary and Joseph would certainly want to do upon the birth of their new baby. And the myrrh was a healing aloe – perfect for baby rashes, cuts, and bruises. The story of Christ’s birth in Matthew contains 5 prophecies (between Matthew 1:18 and 2:23). It is easy to focus on the virgin conception as a stand-out miracle in the life of Christ (and it is), but it is also easy to overlook the miracle of multiple fulfilled prophecies surrounding the birth of Jesus. This 5th prophecy is unique in that it cannot be directly traced to a saying in the Old Testament. Therefore, Matthew could be referring to a general theme that was collectively understood among multiple prophets. And the saying could specifically mean that the Messiah would come from a “backwoods” kind of town (such as Nazareth, see John 1:46). In his commentary on Matthew, Craig Blomberg shows that scholars as early as Jerome (4th Cent.) believed this take on the prophecy (Blomberg, NAC: Matthew, p. 70). Sarah’s Mom, Carolyn, visited us all the way from Denver, CO. We had a great time walking the streets of Richmond, VA and taking a few pictures along the way. Sarah and I have lived here for 2 years and pass some of these tourist sites all the time. It takes an out of town visitor coming to get us to stop and see the great sites that are right in front of us everyday! We have pictures of the Old City Hall (in classic Gothic architecture), Sarah and Carolyn at Cafe Keturra, and Jesse and Sarah in front of the Virginia State Capitol building. 1. The Christmas Card Trick – Take Christmas cards from last year, neatly cut off the half with writing on it. Now you have a fresh new Christmas card. 2. Shop Online – This saves gas and (sometimes) time. Unfortunately, you could find yourself surfing the web for as long as it would take you to go out and buy it at the store. But you can find the best deals on products using web features like “Google Shopping.” That saves the time of going from one store to another during the busy traffic season. 3. Bonus Points – Do you get bonus rewards for your credit/debit cards or sky miles from your airlines? Use some or all of those bonus points towards getting gifts for others this Christmas. 4. Thrift Stores – This is where some of us need to swallow our pride. I just went to four thrift stores here in Richmond, Virginia last week in search for a few small items (computer speakers, a shirt, etc.). While perusing one of the stores, I noticed that they had just received a donation of what appeared to be boxloads of brand new, unopened children’s toys. Perhaps Target got a damaged pallet and just brought the whole thing to the thrift store, even though most of the products inside were just fine. It can be like searching for gold at some of these stores, but the gold is there – even new stuff. 5. Ask Your Family and Friends for Wish Lists – This might be another issue of pride – as you do not want to give the impression that you “don’t know” your friends and family well enough if you have to ask for a list. Some people are good at knowing the perfect gift without asking, but I’m not. My wife and I exchange lists so that each one of us has some idea as to what would be worth while to purchase. If you try to guess what someone wants and then you’re wrong – then that money is pretty much wasted (unless you consider that “it’s the thought that counts”). Make your money go further by getting people what they really want and need. 6. Try to Avoid Gift Cards – This is not a universal law, but a general suggestion. Gift cards can be good sometimes, but for the most part, they are not the best “bang for the buck.” I heard that there is about a 20% profit for businesses when they sell gift cards. Now that does not make sense, but it is true. Companies love to sell gift cards because they know that not all the money will be spent. For every $100 in gift cards a company sells, only $80 will be redeemed. That’s because people forget to use their cards or they use part but not all the card in a purchase. Then the remaining $1.83 goes unspent and expires at some point in time. Furthermore, you could buy a gift card for someone and then the company goes belly up in two months. All of a sudden, the gift card is no longer good because the company went bankrupt or out of business. And it’s not just small companies that go bankrupt, as we all know too well. 7. The “Priceless” Gifts – A few years ago, my wife and I sang a song for her uncle as a Christmas gift to him. He loves the song “O Holy Night.” We printed the lyrics with a nice font and framed the lyrics, which did not cost us much. Then we gave him the framed lyrics and sat at his piano and sang it to him. There are TONS of things we can do for other people that require little or no money. You can write a song, a poem, or a short story. Get some low-cost materials and make sometime (like a craft or woodwork or a painting). You can offer a coupon redeemable for services rendered or simply for time spent together. You could cook a meal or dessert for someone. Use your skills, talents, and hobbies to give people those unique gifts that they will never forget. 8. Give Money, Time, or Skills to a Charity – This might seem counterintuitive. But this is what Christmas is all about – selfless gfits. Just the act of giving without any hope of getting anything in return will put us in the right attitude during Christmastime. When we are in the right attitude of giving, then somehow we do not succumb to the pressure to SPEND, SPEND, SPEND at all the retail stores. Compassion is the opposite of consumerism. Furthermore, God has a way of rewarding cheerful givers (in whichever way He so chooses). 10. Potluck Christmas Parties – You do not have to host a Christmas party and spend tons of money on food for people to enjoy themselves. People come for the friends and family, not the food (well…I come for all three, but that is beside the point). If you put on a big production Christmas party, save some money by toning down the caviar and shrimp. Either simplify the menu or have a potluck. Or you could have people bring ingredients and then you all bake and cook together. Here is our Christmas tree in our small Richmond, VA apartment. We put it up on Saturday. I set it up while Sarah put the ornaments on. It’s a fake from Target. But it does the job. Merry Christmas. Here we go. There’s a ton of blog talk right now about why many churches are closing their doors on December 25th this year. The last time Christmas landed on a Sunday was 1994 (and I think I remember going to church that year on Christmas Day). Many say it is a travesty that the doors are closed since it is a Sunday and it is also the second most important Christian holiday (second only to Easter). If churches usually meet on Sunday, why close it on such a “high holy day”? The critics say that churches are bowing to consumerism and the need for families to open presents around a tree. Others, though, say that no day should be regarded as more holy than another. And each person should make up their own mind about how important they make holidays (see Romans 14 in the Bible). Furthermore, there is talk that family time is a time of worship for many Christian families, so why assume that churches are restricting worship just because they meet on Saturday night? This is Tradition versus Tradition. There is the Tradition of the church meeting on Sunday, the Lord’s Day. This is the first day of the week, the day Jesus rose from the dead (although I’m not sure if the Gregorian calendar can prove that Jesus did in fact rise on a Sunday). All we know is that he arose on the third day, and we remember his crucifixion on a Friday. I side with the second view – that it’s OK to celebrate Christmas as a church on Saturday and with your family on Sunday. For a good explanation of the first view, see Ben Witherington’s blog (www.benwitherington.blogspot.com). Go to Ben’s Dec 4th blog. For someone who supports the second view, see Scot McKnight’s Blog (www.jesuscreed.org). Go to his Dec 8th blog. Tell me your thoughts. ps-there will be some juggling information on here someday!